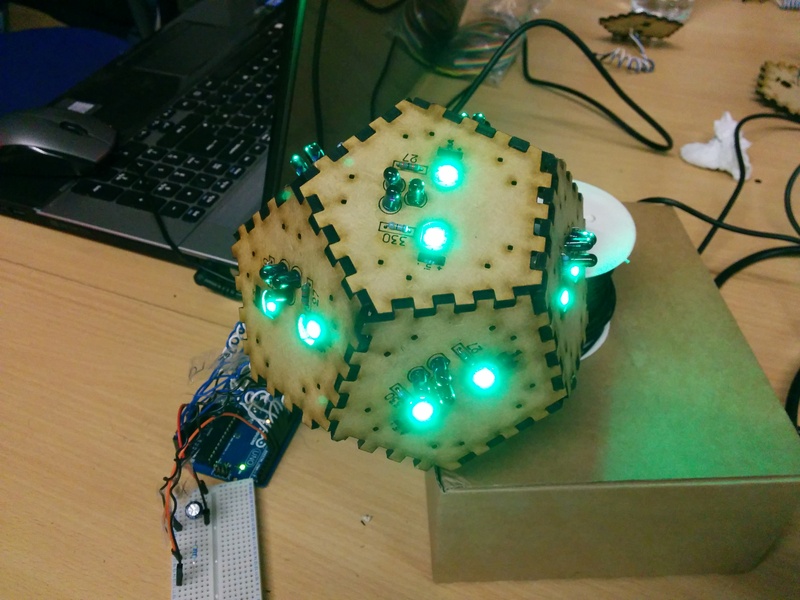 DodecaLEDdron is an alternative controller built in the shape of a dodecahedron. Every face is equipped with a distance sensor and two LED lights. The controller is showcased with Nimbatus, a game by Micha Stettler. The player controls a spaceship, interacting with the faces of the DodecaLEDron. This allows seamless way to power both engines and weapon with fluid and reliable hand gestures. Distance sensors. 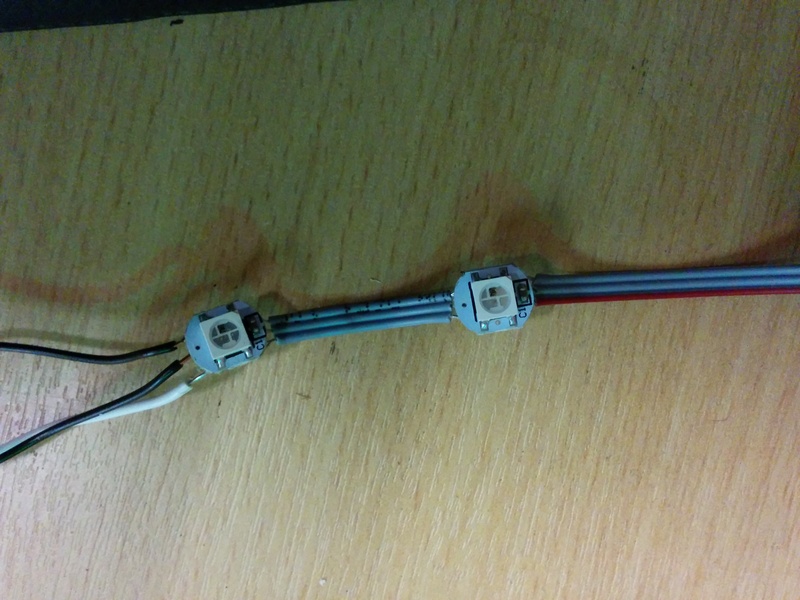 The distance sensor has been implemented using two IR emitters and an IR photodiode. When an object like a hand is approaching the emitters, it reflects some of their light back into the photodiode. This enables for a close-range distance detection (up to 5 centimetres). Kalman filtering is used to reduce sensor noise and inaccuracies. Each face can be calibrated individually to match the background IR noise of its environment. Lights. 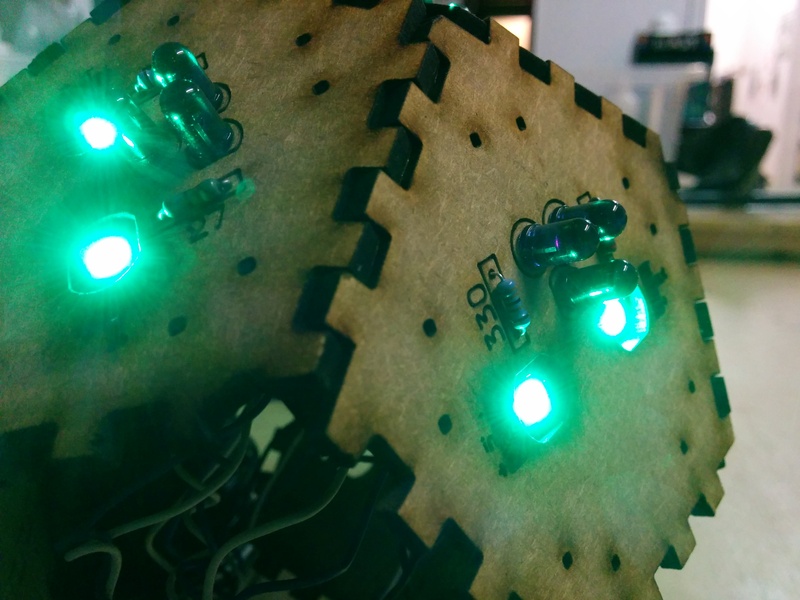 The RGB LED pights used in this project are Adafruit Neopixels. Microcontroller. DodecaLEDron runs on an Arduino Mega, which has enough analog and digital inputs for all the faces of the controller. Case. The external case of the controller is made out of wood (3mm MDF). 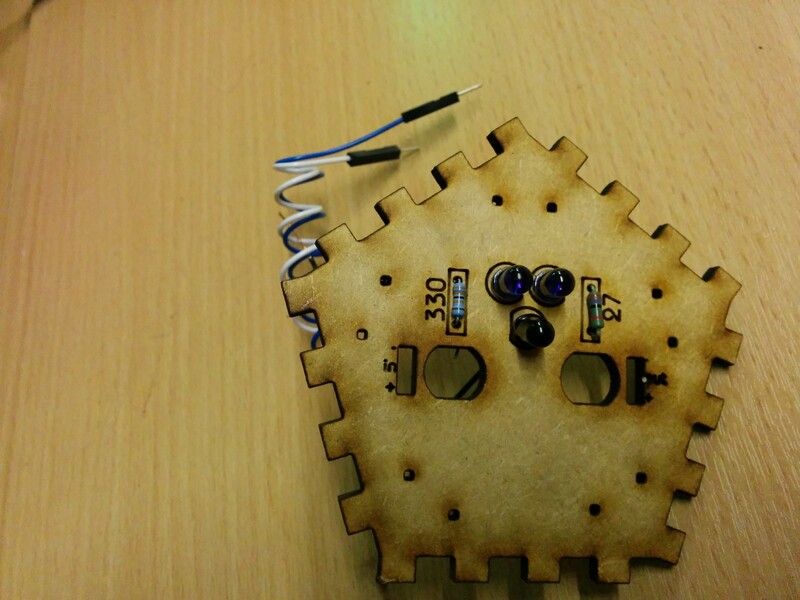 It has been designed using Sketckup and lasercut at the London Hackspace. Every face exposes the circuitry, giving a steampunk finish to the controller. DodecaLEDron is inspired by several other projects, including Pangenerator’s Dodecaudion, markcra’s dodecahedron and Makezine’s dodecahedron speaker. The DodecaLEDron is showcased at GDC 2015 San Francisco, in the Alt.Ctrl.GDC section of the expo.